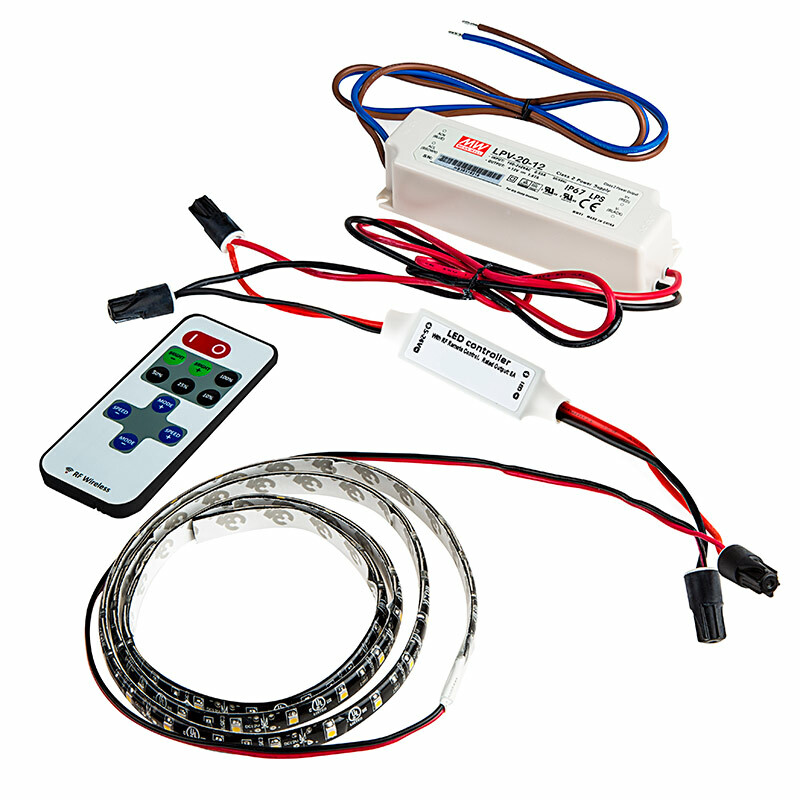 MCBRF-4A Single Color LED Mini Dimmer with Dynamic Modes - RF Remote: Shown Connected To LED Strip And Power Supply (Sold Separately). Universal single color mini LED dimmer with RF remote can dim most 5~24VDC LED products from 15%-100% using Pulse Width Modulation (PWM). 8 dynamic modes with adjustable speed control. Features power cycle mode retention. Maximum load is 4 amps. Attached 4" power input and controller output wire leads. 1 Remote to 1 controller pairing. Range greater than 30ft in open air. 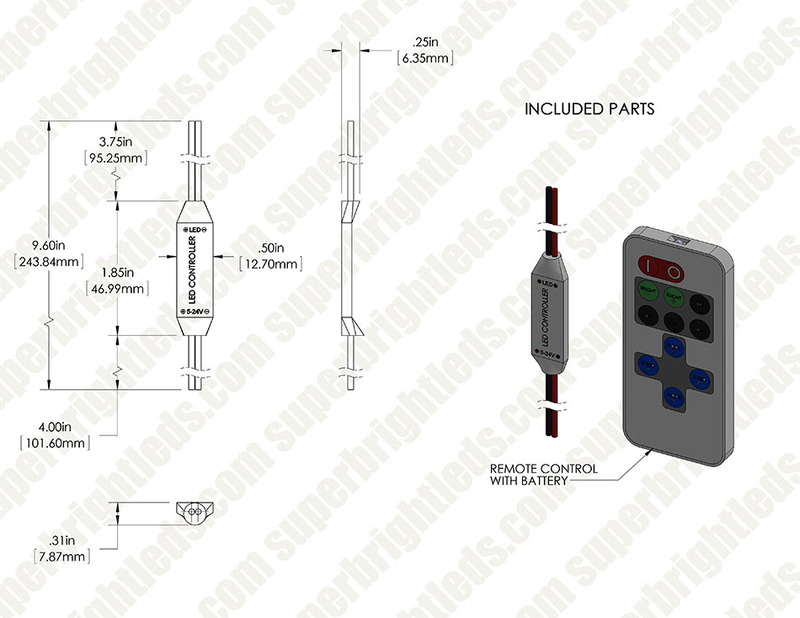 Battery for RF remote included. Turns on controller or enters standby mode. Previous settings recalled on power up. Switch to dynamic mode from static light mode. In dynamic mode these buttons switch between the various dynamic modes. Adjusts speed of dynamic patterns. Press Speed+ to increase speed and press Speed- to decrease it. Unit will automatically switch from static to dynamic mode when pressed. Adjusts brightness in static light mode. Press Bright+ to increase brightness and press Bright- to decrease it. Unit will automatically switch from dynamic mode to static mode when pressed. MCBRF-4A controller is syncable. 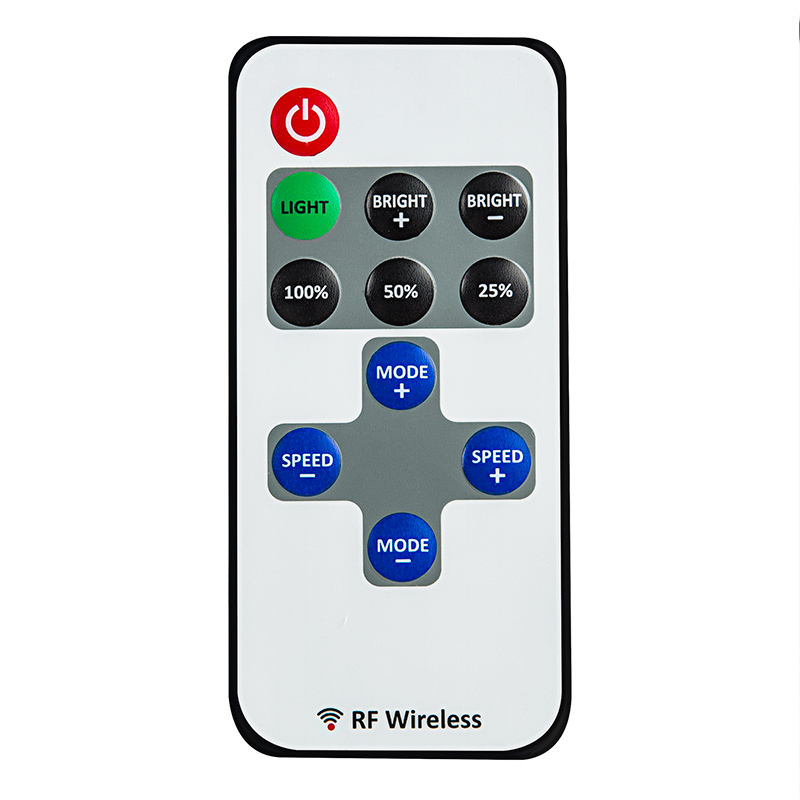 You can sync one remote to multiple controllers, and one controller to up to three remotes. The controller can also be put into a mode where it will respond to any remote. The red output wire should be connected to LED positive and black wire to LED negative. The peak output current is 12A. Do not short circuit the LED output, this may permanently damage the controller! Remove plastic tab from battery compartment. Remote uses 3V CR2025 battery, replace only with same type. Controller can control a maximum of 30 meters of our single color LED Strip. Over 30 meters, the strips have to connect with an amplifier to reinforce the transmission of signal. Use one amplifier for every 30 meters of additional LED Strips. Supply voltage should match operating voltage of led product. This little dimmer does everything the LDRF-8A does, and more... except push 8 amp loads, so if you have a ton of LEDs your out of luck. The number one feature of this dimmer in MY opinion, is that if you have your LED power supply on a physical switch (on / off switch), when you turn the switch on, the dimmer defaults to an ON status. The LDRF-8A defaults to off, forcing you to use the remote to turn them on. The MCBRF-4A can still function if you forget / lose / don't want to use the remote. With the remote, you can switch to pre-set brightness levels (LDRF-8A didn't have pre-set, only slow adjustments with the remote). You can cycle through various pulse modes. You can adjust the brightness other than the 100%/50%/25%, you can adjust the pulse mode speed, and you can turn the lights on or off. When turned off or powered down, the dimmer remembers the previous settings (pulse / speed / brightness) and goes back to it. And it's cheaper... This is the perfect dimmer! This product would be awesome... if it didn't flicker at low brightness. I have it hooked up to an LED strip in my bedroom. I often have it on the lowest brightness and it flickers. It starts to flicker at 25%. Any brightness higher than 25% and it's good. This is an amazing product at a great price! I wired it in, and it worked instantly to control my new LED kitchen lighting. I would actually like less! Please make a simpler model without the disco effects. In household lighting we need nothing more than on/off and dimmer functions. Also, there is no good way to wall mount the remote. Yes, we could simply use double-stick tape, but that will make a mess when battery change time comes. Please make some sort of snap-in trim ring for the remote. This is a great gadget. The remote works perfectly to over 50' indoors. The remote has both rf and led outputs so you can see if the battery is flat. The receiver module is tiny and trivial to wire. My only complaint is the unit has too many modes for household lighting. For under cabinet apps you will have little use for the various strobe modes. In a police car ok, but in a kitchen, no. 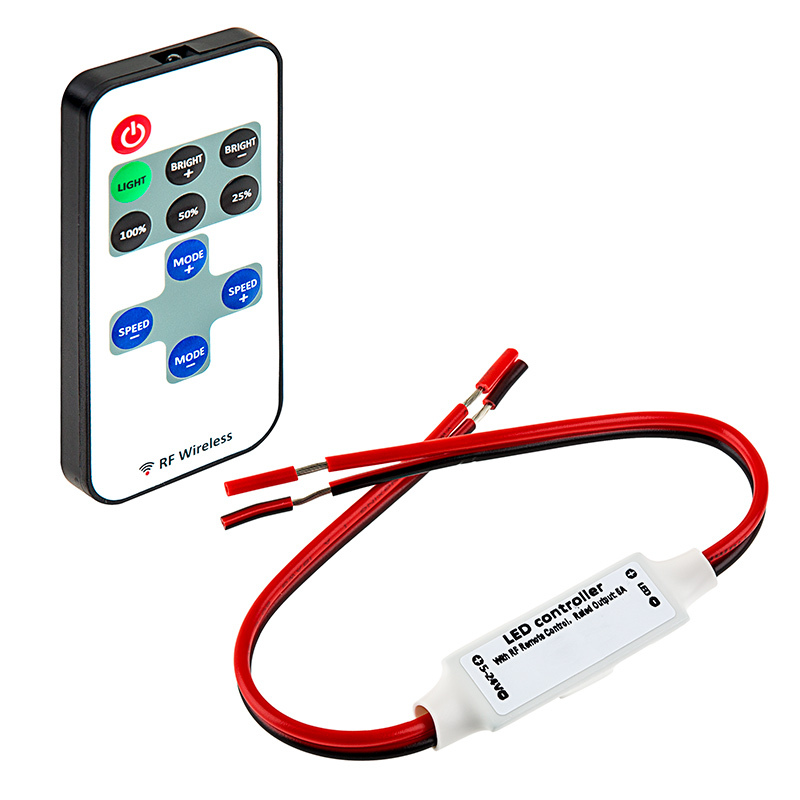 This compact unit is easily wired into a DC circuit to give control the intensity. Yes, it has various flashing modes but for my landscape lighting they are not needed. Yes, the unit remembers the last setting so it can be wired after a timer. Remember that the range is limited and 40’ is the most you can expect with 25’ being more realistic.